Our Waterfront Chats meetup series is geared at start-up businesses and provides an opportunity to hear from and network with local entrepreneurs and organizations. Learn about their successes, barriers and challenges to launching and growing their small businesses. Attendees will also be given an opportunity to provide a thirty-second pitch and network. We hold Meetups almost every month, and every event will be unique. Small Business BC Meetups are open to entrepreneurs at any stage of business and from all industries. Follow the conversation using #SBBCMeetup. 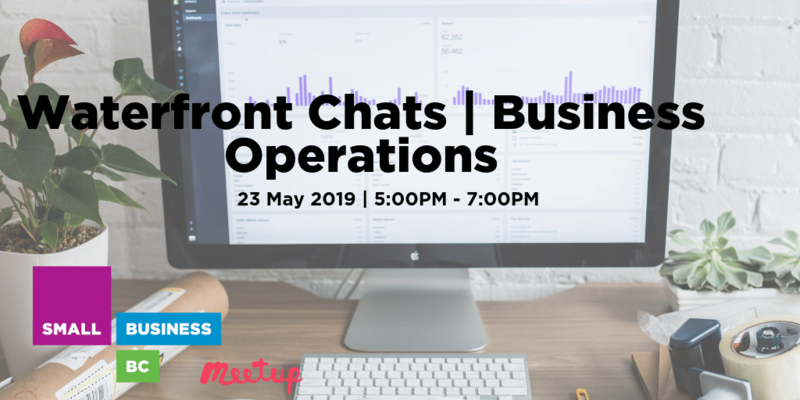 This months Business Operations meetup is geared at start-up businesses and provides an opportunity to hear from and network with local entrepreneurs and support companies. Learn about their successes, barriers and challenges to launching and growing their small businesses. Attendees will also be given an opportunity to provide a thirty-second pitch and network. Tim is a dynamic and creative technology business management professional with 20+ years experience in the technology sector. With specific expertise in website, enterprise software and online applications design and development processes, and technology planning and implementation, Tim combines a strong entrepreneurial drive with a ‘can-do’ attitude and collaborative approach to business and technical project management and strategic business planning. Reserve your place now, as space is limited! Staying up-to-date and establishing yourself as a key player in your network are crucial to starting and growing a successful business. Take advantage of Small Business BC’s brand new monthly meetups, so you can stay on top of business trends and mingle with your customers, clients, like-minded peers and local industry influencers. Each month these casual events that address common opportunities and challenges that entrepreneurs and small business owners face today, and leverage networking sessions with valuable connections. Small Business BC Meetups are located at Small Business BC’s Lower Mainland location at Waterfront Station. Each month’s event will have a different theme and will also feature guest speakers who will share their experiences and provide valuable insight into how you can achieve your goals. Topics will include starting up, growing your business, and international trade. Step 1: Click the SBBC Meetup Group link. Step 2: Find the latest SBBC Meetup. For sponsorship opportunities, please call 604-775-6255.